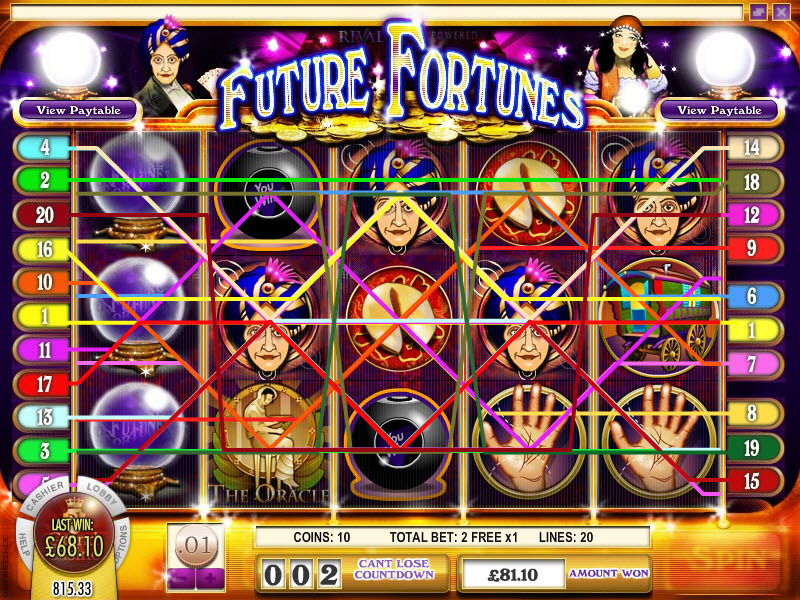 Future Fortunes Slots is a 5 reel 20 pay-line format. The game scenario is based on visits to fortune tellers such as Madam Zarah and Mr. Omar where you find out how lucky you are. An atmosphere full of magic and mystery is created using intriguing music, subdued colors and mysterious heroes. You have the chance to win a top jackpot of 5,000 coins. Extra features such as Free Spins and Bonus Rounds make this slot exciting to play. There are not many coin sizes to select from, but you can cover all 20 pay-lines with a minimum bet of $0.20. The maximum bet on this slot is $20. The highest jackpot is 5,000 coins or $5,000 for 5 Crystal Balls, followed by 1,000 coins or $1,000 for 4 Crystal Balls.and 500 coins or $500 for 5 Gipsys. The Crystal Ball acts as the wild symbol and can substitute any other icon except for the scatter symbols, thereby producing more winning combinations. The two scatter symbols – Tarot Cards and Ouija Board – do not produce winning combinations with awards. However, each of them can activate the bonus feature. Three or more Ouija Boards on the reels activate 5 Free Spins. The wild symbol expands on the first reel so that each of these 5 Free Spins will bring you a prize. By getting three or more Tarot Cards the Fortunes Bonus Round is activated. You select a card from the two offered and Mr. Omar predicts your prize. If Mr. Omar predicts correctly you win, but if he is wrong the bonus feature ends. You have a chance to win up to 900x your total bet. so you can get up to $18,000. You do not need any special software as this slot is available in flash version.